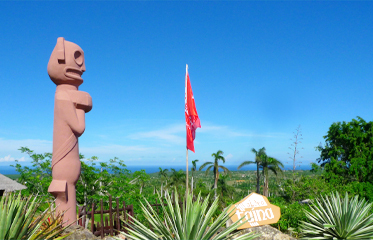 In the reconstructed village of pre hispanic aboriginals Aldea Taina in Choro de Maitta we found this very interesting plaza. Village is archaeologically authentic and it is near the largest necropolis excavated in the whole Caribian. 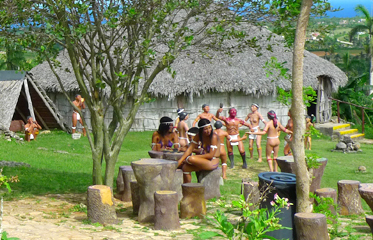 You can have a sense that this space is quite realistic if you have in mind reconstructed aboriginal villages all over North America and compared to the Maya City of ek'Balam or Chichen Itza in Mexico that we have an opportunity to visit. Similarity and social need is obvious. All main village functions are located on the plaza, dance space, patch of agricultural land, hut of the main person in the village etc. 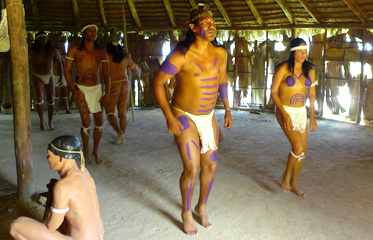 In this case experience is enhanced by the group of chosen students from the nearby city of Holguin who are reenacting rituals and dances of the ancient civilization. Dressed very authentic and modest behaviour is just what is needed for complete experience. Tip for visitors: Do not miss already mentioned necropolis across the narrow road with displays of some amazing artifact found here. Restaurant located in the village is serving excellent authentic food.